Photo: Hanlon-Osbakken House, ca. 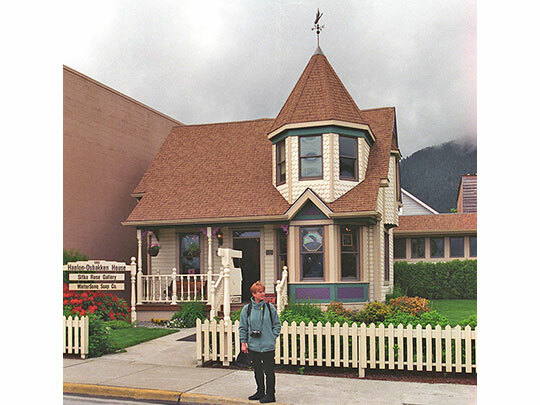 1896, 419 Lincoln Street, Sitka, AK. Listed on the National Register of Historic Places in 1992. Photographed by user:Jerzystrzelecki (own work), 1998, [cc-by-3.0 (creativecommons.org/licenses/by/3.0)], via Wikimedia Commons, accessed October, 2015. Sitka administrative offices are located at 100 Lincoln Street, Sitka, AK 99835; phone: 907-747-3294. Sitka  was originally inhabited by a major tribe of Tlingits, who called the village "Shee Atika." It was discovered by the Russian Vitus Bering expedition in 1741, and the site became "New Archangel" in 1799. St. Michael's Redoubt trading post and fort were built here by Alexander Baranof, manager of the Russian-American company. Tlingits burned down the fort and looted the warehouse in 1802. In 1804, the Russians retaliated by destroying the Tlingit Fort, in the Battle of Sitka. This was the last major stand by the Tlingits against the Russians, and the Indians evacuated the area until about 1822. By 1808, Sitka was the capital of Russian Alaska. Baranof was Governor from 1790 through 1818. During the mid-1800s, Sitka was the major port on the north Pacific coast, with ships calling from many nations. Furs destined for European and Asian markets were the main export, but salmon, lumber and ice were also exported to Hawaii, Mexico and California. After the purchase of Alaska by the U.S. in 1867, it remained the capital of the Territory until 1906, when the seat of government was moved to Juneau. A Presbyterian missionary, Sheldon Jackson, started a school, and in 1878 one of the first canneries in Alaska was built in Sitka. During the early 1900s, gold mines contributed to its growth, and the City was incorporated in 1913. During World War II, the town was fortified and the U.S. Navy built an air base on Japonski Island across the harbor, with 30,000 military personnel and over 7,000 civilians. After the war, the BIA converted some of the buildings to be used as a boarding school for Alaska Natives, Mt. Edgecumbe High School. The U.S. Coast Guard now maintains the air station and other facilities on the Island. A large pulp mill began operations at Silver Bay in 1960. In 1971, the City and Borough governments were unified. Sitka offers abundant resources and a diverse economy. Alaska Community Database, State of Alaska Department of Commerce, Community & Economic Development http://www.commerce.state.ak.us/dca/commdb/CIS.cfm via www.cityofsitka.com, accessed October, 2015.